Testimonials and Clients Comments about Inter-Marriage Dating agency. Before giving you my testimony, I would like to inform you of the valuable help that I received from the advice that I drew from both the Inter-Marriage agency's website and my discussions with Ms. Fedorova. I contacted the agency in May 2016, my wife and I united our lives in April 2017 and since June 2017 we live together in France. Aged 56 y.o. when I joined the Inter-Marriage agency, I had been married 2 times and I was not struggling to find a companion. Only I did not want to live a failure and I considered my next union as the last one. I went to the site of this marriage agency by curiosity, prompted by the positive echoes that I had, not without some distrust, I must admit. I addressed a mail, as it was proposed to me, to 10 different Slavic women without really believing but while taking care to choose according to profiles, according to my criteria, by personalizing each letter and especially taking into account wise advice found on this website. I was very concerned not to focus on the photos and to try to discern personality traits in the profiles. I received 8 positive responses. I read the answers carefully and made a selection. After 1 month of regular exchanges with 3 ladies, I went to Nikolaev in Ukraine in June 2016 to meet the person I liked the most. The welcome, was perfect in every way and the availability of the professionals of the local agency and the interpreter, is matched only by their kindness. After 1 week in Nikolaev we realized that we did not feel feelings strong enough to unite us. I had favoured 3 contacts so I decided to go to Zaporozhia the next month in Ukraine, meet another lady. We spent a week together and there were no feelings also. The local agency just as professional and available as the previous, offered me another meeting the day before my departure. I accepted and after one evening and 1 month of correspondence, I returned to spend a few days in Zaporozhia. The day before my return to France, I decided to end our relationship. I had made the choice to meet one person at a time, to establish a regular e-mail correspondence, to spend a few days together in Ukraine and especially not to rush without first checking that, in my opinion, the conditions for a successful union were real. The ladies I met, are determined to find a husband they love, are happy in their country, intelligent, cultivated, and physically and by elegance, have nothing to envy the French women. I had to respect them, to be honest with them, sincere and to devote the means to make our meeting a unique moment. In this regard, it is necessary to integrate well that this approach has a cost, that it requires time and energy and that all this is justified. How could it be otherwise when you're looking for the person with whom you'll share your life? Being in complete trust with the agency, I have never felt the fear of being exploited. Again, thank you to Mrs Fedorova, for her professionalism and empathy. Last night, the Zaporozhia agency offered me to meet another woman. I accepted and it was great decision since I had a wonderful evening with the woman who has since become my wife. We immediately liked each other. The rest chained naturally. Anzhela had been in an agency for 4 years. She had previously met other men without following up. A great traveller, she had travelled to a Ukrainian friend's house in New Zealand, Mexico, the United Kingdom for work and part of her family lives in Los Angeles. She was spoiled for choice to emigrate in good conditions. Speaking very well English and not French, at no time had she considered living in France. It is therefore the feelings we feel for each other that have determined her choice. I made several trips to Ukraine, spending there 3 to 4 days each time. I met her parents, her children, and her friends. Anzhela came to France for the end of year celebrations. And we decided to get married in Ukraine. Since her son and her friend came to spend a few days this summer in France and I am part of a united family, warm and very open. In conclusion, I wish to reiterate how much the Inter-Marriage agency has been of decisive help, that the ladies I met, really want to find the man of their life and that it is important to be yourself, even while absorbing differences between our cultures. In this regard, Mrs Fedorova is carrying an analysis that I found very relevant and which has been constantly verified. Anzhela has adapted perfectly to her new life. She is currently for a week in Ukraine to see her children; her family, her friends and can not wait to come back home. This summary contains a few words describing my past quest to find love. After a long and dark period, due to a tough break-up, I decided that it was time to leave behind all the sadness and solitude to search for another companion I could share my happiness with. This need for a new life filled with promises, after having endured change to my highest expectations, it was now time to find love and my new companion had to be different. I had always been attracted to Slavic culture, so I naturally turned to the East. After a quick search on the internet, I had an assembly of agencies, mostly abroad. The most unique agency was Inter-Mariage because of their presentation: They had clear and precise platform, many useful tips, red flags on scams to be aware of, a detailed member profile, and the cherry on top was the free trial period. Fortunately, there was a phone number… and I called. Mrs. Fedorova then answered all my questions on the phone and later, we exchanged several e-mails which was reassuring. I wrote my first letters to the members, which I assure was not an easy task, but once they were sent, I waited impatiently for the answers. When I received the response, I read each one with utter pleasure. And suddenly, I was not alone. I soon shared a very special connection with an adherent that I had established much attraction to. Soon I took a trip to St. Petersburg to meet my correspondent. Unfortunately, things did not go as I had wished them to (But in hindsight, it’s only normal because it’s the same as a meeting in France). Sadness and despair once again took their fair share of my daily life. However, this time, Mr. Fedorova was there, reassuring me and giving me valuable advice, which I cherished so since they renewed my inner motivation and gave me hope. His support was far more intimate for an employee at a matrimonial agency. To this day, I remember our conversation and his sincerity which I really thank him for. Later, I made more journeys to Russia and eventually to Ukraine. During all these trips, Inter-mariage had made all arrangements for local taxi services, hotels, and meeting with my companion. This came in handy especially since my knowledge of Russian was limited to “da” and “niet”. And one day, during a trip to Dnipropetrovsk, I met, Olga, my princess. Then during spring, we found ourselves resting under Athens’s sun for a short period, before heading to France. A new life had then begun and as a divine result of our love, my second princess was born. To this day, I enjoy each of their company oh so dearly. I now look forward to the end of the day so that I can go home to find my sweet little family. Through this testimony, I want to sincerely thank Mrs. Fedorova and Mrs. Polina from the agency of Dnipropetrovsk for their help through which none of this would have been possible without. And I appreciate how they give hope to all who were experiencing loneliness as I did. At the age of forty, after having spent most of my life at the office, I decided to work on my personal life. I looked for professionals who could seriously accompany me in this process. I talked to several agencies, but it was the matrimonial agency Inter-Mariage that caught my attention. I then quickly exchanged letters by mail with several young Slavic ladies, and then traveled twice to Ukraine to meet them. I came across my rare gem. She then came to visit me in France and we quickly decided to get married, which was just a few months later. - For those who are not too familiar with Eastern countries, the description on Inter-Mariage.com website on young ladies’ personality is in my opinion very-well done. "We must meet with several young ladies, and above all we must take time to get to know them physically." - Once you have met them, you will easily be able to recognize those who are genuinely into you. - Regarding the lady’s visa, it is better to go through the local agency, otherwise you will find it rather difficult to sort out by yourself. It is advisable to get a Schengen visa from a different country than yours, and to listen to what they tell you. First you should visit said country, then go to your final destination. - The first visa will only offer a maximum of 45 days, use this time to its fullest. You will have to wait a period of 3 months after obtaining the first visa before applying for a new one. We used this tourist visa to get married. - Then, regarding the City Hall, I opted for the provincial City hall of my parents who were much more lenient and paid attention to the issues we had at that time. At first, we had a civil marriage in a small committee in order to advance on administrative matters. We will celebrate our marriage in 2017. In the new year of 2017, we wish you to meet your half, a serious subject on which Inter-Marriage will be able to help you with. I am a 33-year-old man. In my life, I have gathered only sentimental failures and his can seriously destroy a man regardless of his age. I turned to dating sites, which, for my part, never resulted in serious relationships. So, I resorted to the women of the East after having seen a TV show. I decided not to give up yet, I wanted to make one last trip to a different city. I went to Mykolaev (Nikolaev) to meet two women, and upon the first encounter there was compassion from both sides. We fell in love and two weeks later she visited France for two weeks. Two weeks after that, I returned to Ukraine as for her hand in marriage (surprise). We then married in Ukraine, it was magical. I thank Inter-Marriage who allowed me to meet my wife who gives me but happiness. After my divorce, I was completely wiped out. My priority was taking time to get better. I did not want to have physical contact but was desperate to finding someone. What was I supposed to do? My heart was void, with no desire to skim bars, clubs or anything. I chose a different approach to meet someone; the internet. This way I could build a relationship based on discovery through dialogue and with no obligations for but with the will to build a relationship based on the discovery of the other through dialogue and without the obligation of getting physical. Simply because during those times I was incapable. Eventually, I discovered the Inter-mariage site. What attracted me most: The sincerity of their cause. That is for sure. Throughout our conversations, I witnessed how much of a professional Marina and her partners were. Today; 5 months after my first true connection ... I am once again married ... Svetlana and I united on August 20, 2016 ... I have never sincerely imagined it to be this quick... But life is full of surprises! Like lighting! If the wait gets unbearable and you cannot but travel to her, then I can assure you without reservation that if your approach is pure, you are motivated, sincere, and have the means to reach for your ambitions then Inter-mariage is the foundation to your new life. I wish you find what you are looking for and wish you but the best this world must offer you in its endeavors. In the past, I had made several trips to Ukraine, felt comfortable with the Ukrainians, learned its cultures and already picked up a few words. Valeriya took English classes and you wouldn’t believe the progress she had made in 6 months’ time. You and Polina had already told me I did not have to focus on finding someone who spoke English since you knew girls from the East learn very quick. I now realize that I made the right choice by choosing your serious and direct agency. The same goes to your agency partner Polina; whom rendered herself a great and useful guide. If we have serious ambitions in life, then there is no reason that we will not succeed if we set goals towards it. After my first trip, I was completely seduced by the women of the Eastern countries, they were; beautiful, classy, caring, independent, had upright family values, and where virtuous conversationalists. My choice of going through your agency truly changed my life. The first trip changed me by giving me hope, it has become too difficult to make quality and sustainable encounters nowadays in Europe! Not everyone is fit to have a companion from countries of the East because it is a particular culture and way of life; for instance, the girls are very skilled with their hands, which is quite contrary to European women. I am fortunate that my roots are compatible with the culture of Eastern European women. The Slavic women are princesses that need plenty consideration and affection but in return, they give you love in tenfold and will always be there for you no matter what. After my first trip to Ukraine I was only thinking of going back, and this journey reconciled me with the issues I had with relationships with women (even though I have already had quite many relationships in Europe). As a tax manager in a US company based in Luxembourg, I can say that working with a service provider such as Inter-Mariage and its network of branches in Ukraine; including that of Dnipropetrosk, they are a true asset to guaranteed success and truly an agency of great quality to affordability rate. There are very few providers (amongst of which I work next door to) who have that seriousness, reactivity and transparency. I hope many people in Europe as well as my French compatriots will get a chance to read this testimony, and that they will overcome any barriers they face today by passing through Marina Fedorova’s agency to rediscover the happiness. René and Karina announced their wedding on August 29, 2015 in Orthez, France. In Dnepropetrovsk, I met several Ukrainian ladies magnificent in all points of view, whether aesthetically, morally or intellectually. Unfortunately, we did not have the mutual desire to continue our paths together for various reasons. So, I made the choice to continually persist in my search for my significant other and with the help of partner agencies in Dnepropetrovsk. I got to know Mrs. Karina who turned out to be a sincere and courageous woman 11 years younger than myself even though I am not a very attractive man due to my vulgar physique and despite my unstable professional situation, she saw my other qualities certainly. So, to conclude our adventure together, we chose one another amongst many others because we trusted each other from the very beginning and we began to appreciate each other and we had both wanted to fall in love from the beginning. I would like to add that I proposed to her a clear and precise marriage plan and she agreed to go through with the commitment. It is of utmost pleasure that I inform to you that Dina and I got married on the 14th of last March; her family came from Russia (her parents and her brother with his wife and their two children). It was a very nice party; our two families got along very well and are most certainly a second family to me now. Dina and I love each other very much; I would have never had a similar opportunity to meet a woman like her, neither in Morocco, nor in France. She is now done with her sixth month of pregnancy, and everyone is waiting impatiently for our little girl. I owe all of this to you, and thank you sincerely from the bottom of my heart. Inter-Marriage has changed my life! Before knowing your website, I thought it was impossible to make a serious encounter on the Internet and even less with a Russian woman! I was wrong. Of course, it was not simple but in hindsight the drawbacks were relatively few. When there’s a will there’s a way! I first registered for free on your site and then I presented you a list of several people that I had selected through photos and it all began: The responses from some of them, my paid subscription - but very affordable, a regular match and eventually live meetings in St. Petersburg. You can effortlessly arrange all the logistics with your local connections and provide a psychological or cultural assistant. In short, it's a real delight to discover this wonderful city and its inhabitants who are as wonderful. Eventually what was meant to happened finally did. Of course, it took me 3 trips and multiple meetings to find the one that became my wife last April. Elena is lovely, cultivated, considerate, open to a new life in a new country and eager to integrate into it as quickly as possible, something she has already partially succeeded in doing. All this would not have been possible without the help of Inter-Mariage, who had put us in the saddle and, above all, without Alexandra; a PM relay in St. Petersburg that had provided the most favorable environment and relentlessly tried to find the perfect agreement. She is now a friend who made me fall in love with Russia and one of her compatriots! Thanks to you two and long live Inter-Marriage! It was through a friend’s advice that made me go to Madame Fedorova’s matrimonial agency Inter-Mariage. I immediately realized that it was someone serious and when Madame Fedorova gave me a choice to choose from fifteen ladies of her site which I could contact for free and with no obligation to become Member, I did not hesitate. To my surprise, it was great when most the ladies got back to me positively. My choice of going to the country to meet all these ladies proved to be good because I quickly realized their agency was very well organized, and very professional which was pretty ok. I went back a second time to see some of the ladies I had selected after my first visit. And I had the chance to find the woman of my life, Anna. From the beginning, even as we did not speak the same language, we understood each other and very quickly we no longer needed a translator. 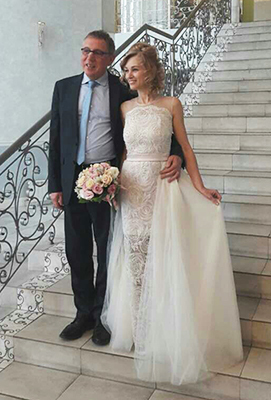 We got married last April on the 10th at the Town Hall in Dnepropetrovsk and my wife organized our wedding party last 10th of May which was an unforgettable experience with lots of interesting people who were happy to celebrate this day with us. Even the heads of local agencies, Mrs. Anna and Mrs. Polina, came to celebrate with us. Now we all live together as a family (Anna has 2 children) and are all very happy. Mrs. Fedorova, I would like to thank you from the bottom of my heart for the good advice and for your professional service. Thanks to you I met the woman of my life and I am indeed very happy. Your very mission is to make people happy. I am sending you this note to thank you for the determination which you have shown, as well as Polina of the agency of Dnepropetrovsk to get me out of this sentimental rut which had bogged me down for several years. Natalia and I have been married since the end of October 2013; only a year after our first encounter, and we both live our little happy lives, made up of everyday things that are very routine but follow one another so naturally. Natalia is, of course, a very beautiful woman but it is our deep connection and unison, that fills my coming days with happiness. I feel soothed. We have always been very strong together thanks to the help of the administration, and we will be even stronger in the future. The word "couple" now makes sense. For your future adherents, I send a message of kindness and advice: Never give up, never despair of finding your half even if some encounters are disappointing. When you have found it, commit all your energy to it because it is a certain that your wife will share the same energy for you. The strength of feelings, is the Slavic spirit. Would longevity be a sign of quality? Today in August 2013 we celebrate the memory of meeting each other on February 2007 thanks to the mediation of Marina Fedorova. After the first emotions, the effort of integrating a foreign woman and her teenage daughter in France required great will and a long-term commitment from all the three of us. It was more; however, for my younger children. We successfully took these steps, notably teaching them the French language and helping them adapt to a very different culture. I owe thanks to her private teacher, but also to the French education system (secondary school, high school, university). The proximity of a network of Slavic friends has also helped us, because there is of course an initial feeling of uprooting. Now my wife speaks French fluently, her daughter just finished her studies, and we now both live together serenely and with constant love. I will take a few moments time to give you a short summary of what happened since my marriage. After 4 months of intense discussions with your efficient services, my first encounter with Kateryna in January in Nikolaev was fusional and instantaneous; it will always remain an unforgettable experience in my mind. I admire how serious the teams of your agency were, and at how professionally Irina Nikolaev handled her business. I went back to Ukraine in March, I met the whole family and we announced our decision to get married. We then met again in Turkey, during these few months we overcame all our tedious administrative errands! So, we celebrated our wedding on July 13, 2012. My pretty flower and I are now one; After the five weeks of having received her marriage visa, she returned to Ukraine. We are now waiting for the small French test and the long stay visa, for her conclusive arrival in France! We spend the entire day on Skype together waiting for her arrival in the coming 3 or 4 weeks. A perfect balance! And a new beginning to my life and I owe thanks to you and your agency. I therefore thank you from the bottom of my heart for being the link to take me closer to the happiness of my life. Yours truly and once again, I sincerely thank you and your team. Everything is going great between me and Natalia who is the tastiest woman and is of great value to me. I hold great regard to your valuable information and your services that highlight both the use of internet, and that of your agency. I also appreciate how professionally your correspondent agency in Nikolaev complied with all its commitments and how effectively it did so. I thank you sincerely and I am glad to have had the confidence in hiring your agency. In search of a new soul mate, my story begins well before having signed up with Inter-Mariage in 2007. After my big break-up, I went to a very well-known agency that sold me a dream by pitching me their marketing plan which included: a beautiful reception in gorgeous offices, contact with a house psychologist, accessibility to a guestbook, availability of a catalog with various women with different options for quantity over time that I could afford to pay. Since I was a rookie in the field: I immediately signed the contract because I wanted to fill my loneliness no matter what the cost or consequence. Unfortunately, the results did not live up to what I expected them to be. In my opinion, for a good match to happen between a man and a woman, it is necessary for the agency to study their candidates to the fullest to be able to have a blueprint of who to match with whom. I found out the hard way that this was not at all the case with the agency that I had signed myself up with. To avoid this kind of costly mishap, you should seek help by those who have a professional work-ethic and who offer free and truly motivated candidates for a couple's life. Indeed, it is necessary above all to empathize with a woman who does not have the same culture as yours and to achieve this I strongly advise you to read and apply Marina’s advice: write to a Slavic woman and prepare a meeting. The film played by Michel blanc "I find you very beautiful" is quite close to reality in my opinion. To look relentlessly for the people who want to rekindle or to establish a new connection with a Slavic woman. A relationship for a marriage is similar to that of a divorce, each story is different. I met Tatiana because she was the only "candidate" who wrote me a letter with words that showed a sincere loving and generous nature. I was quickly certain about her willingness to find the right man for herself and for her son. She was exactly the person that I had sought out to find. I was immediately infatuated by her. However, she was not! And I will always remember what she told me on that day. "I will only love you more and more." Only few will understand what the "Slavic soul" really is! So, we stayed together for a while at Sebastopol and then one morning, she left. I wanted to understand why! I went to look for to help her deal with all the anxieties that she had been facing; she now had to follow a stranger to a foreign country and was maybe feeling remorse to leave her country, family, and friends behind. I insisted to reassure her until she was convinced and finally came back and I do not regret anything. My love for the woman who would later become my wife in 2009 finally made me realize that I am at piece with our situation. She came to live with me in France, now we share our life between France and Ukraine where we have elected our home. So, I would like to thank Marina for the quality of her professional work that brought all the ingredients for a happy marriage together. Two years ago, we met in the most explosive way, you remember? Everything was done to separate us. But destiny wanted otherwise. Our fates were written in advance, I had always known, without ever wanting to confess. After having spent all this time by your side, I think the moment to record these 2 years has finally come. For the commoner of mortals, this seems very long. And yet, everything happened so quickly. With our well-tempered characteristics, our Slavic characters ... It took us 6 months to find our agreement. Do you remember the many times you were angered by my misfortunes? All those times you asked me to write shorter letters? And all the time and effort you put into preparing for this adventure? But you never gave up. You have done everything in your power to listen and to empathize with me and see the world through my own eyes, mind and soul ... Were we so different? And yes, I'm French, but deep inside me, you knew I was Ukrainian. You then took attention to awaken what had been sleeping in me for so long. You helped me trace back my origins, and gave my grandfather the chance to return home after all these years, when he had been so far from his family. You gave me the vision, and the ability to feel the emotions of our country. But do you think that it concerns only me? No. you can see it in my daughters today, through their ways of acting and thinking. They revealed their true nature. Ask them, their nationalities, they will shout that they are Ukrainian! Watching my father, at each of my returns, he also totally changed. Over the past year, I have just lived 6 months in Ukraine. Not for a simple holiday, but for living with the woman I am going to marry. A wedding that will take place in his city, Nikolayev. My grandfather immigrated to France while I moved to Ukraine. What a wonderful paradox! You wanted to put a little warmth in our hearts… You woke up a volcano. To whom do we owe this? None other than to you, Marina. It was with boundless sentiment to receive your testimony of affection... We passed through a long trial period; 17 months precisely... and yet had known since April 03, 2011, when our eyes met for the first time, that this day would arrive ...))) It couldn’t have gone better, we were made for each other, but we were just afraid to commit ourselves to each other. You have always accompanied us in our long walk through our big quest, you have guided us, and it is in your presence that we have united. Our thoughts are always with you and we hope that you will always have the strength to offer even more people the chance to live and feel the very endeavors that we have lived and felt. I also would like to thank you husband, without whom none of this could have happened. He met you, loved and gave you the strength and energy to fulfill your dreams. Also for your children, who offer you the tenderness and love every day that you radiate across your agency and that of your partners. It is not only a young woman who realizes the prodigy to offer happiness around oneself, but a whole family. A family, which we often forget. I would like you to know that Tatiana and Nicolas will always have a special place in their hearts for your family. I will now tell you a story of a single man who spends his life separated from his companion and lives alone. It is said that solitude is to the mind what the diet is to the body; essential for its benefits but cruel to the body. He makes various encounters; good and bad, but always dwells for a flame. On a rainy Sunday, he surfs the internet and randomly stumbles upon the Inter-Mariage agency website rendering him eager to devour all its well-written contents. The determination, humbleness, and beauty of the Slavic women all but seduce him instantaneously. Eventually; after a couple of matches, he wants to meet the women who take their time to listen to him from the opposite side of the world. Seeking for advice; the next day, he calls the manager Marina who tells him of the steps he should follow in order to receive a positive response. He told her that he would rather have real and direct encounters rather than writing long letters for weeks. After some communication, four weeks later he landed in an unknown country; Ukraine, and more particularly in a city to which its name; for him, was just unpronounceable (Dnepropetrovsk). He is then greeted by a translator assigned by Inter-Mariage named Julia, who will then provide essential advice for his future meetings. She also warned him about the pitfalls that should be avoided; she said to stay realistic and always give an honest judgment. Soon, the manager of the local agency; Polina, uses her great skills to manage different appointments and one day presents her to these delightful correspondents and for the first time in a long time; the flame inside was alive, and he falls under a spell. At that moment, he is far from imagining what was to happen next. One of these ladies was called Nataliya; this is when he first notices a typical Ukranian birthday. He meets her on a Friday night in a restaurant on the river bank, where she holds a typical Ukrainian birthday (women and men sitting, eating, singing and dancing while Russian films play in the background). It would later be a magical encounter and he will be charmed by her beauty. A brunette with her hair worn to the side, wearing simple white jeans, heels, and a top with green and black laces. He had never imagined she could wear that outdoors. One look into her eyes and he dive so deep, it gives him a rush. She is beautiful, well-dressed, charismatic, intelligent, and with the personality of fire itself… She really knows how to live. The discussions take place at a hot pace thanks to the extraordinary translator who speaks perfect French and is completely inconspicuous. What collusion! Having that much in common and 2600 kilometers apart! In these moments, we wonder if it is all possible. And as the days move forward; a magical year later, all those expeditions lead to a successful couple’s marriage. Of course, there is still much to tell, but one can only tell so much. And this is my wonderful story, I offer this testimony in an effort to say that this kind of service from any agency does not come around very often. Finally, I am very grateful for the great job, to those who are often criticized for what they do (it is not easy to do business when one touches the sentiment). Marina, Polina and especially Julia for without whom nothing would have been possible. Thank you. Subscribing to a marriage agency was a new thing for me to do. Having spent my Christmas holidays alone, I looked up the contact details of a matrimonial agency on the internet. I found various agencies online, but I chose Marina’s agency for two reasons; their website had provided pictures of all their members and Marina had put her picture on the site. This last point seemed essential to me because the business of marriage agency is based on human relations and knowing the client on a personal basis, especially for this type of an approach. The latter, seems essential to me.The young woman who had caught Marina's attention among no less than 50 profiles was the one who was to become my wife ... I did not; however, want to focus on that one fortune in fright of losing all prospects, I thus continued conversing with a few other members. I then realized that some of them did not correspond much to my physical preference nor age or personality for the matter. Some of them were already married, others were not too motivated while even some of them did not have the most honest intentions. That was when I indeed realize that it would be much safer to go with Marina's agency. Certainly, Marina never seized to warn me the moment that she felt something was unclear about a girl. Moreover, every remark she had given me was surely for the better and was indubitably felt afterwards. Without any negative criticism on her part towards the members, she was always attentively looking out for me and was committed to spend time for me without even holding me accountable or any reservation for the matter; her goal was to advise me throughout this whole experience while looking out for my best interests. Marina was actually considerably blunt and straight forward, she wouldn’t only tell me things simply for the fact that I would like to hear them… but she was completely honest and spoke her heart at all times. This was the very reason that I made the least possible mistakes I could.Having had a complex relationship with my correspondents, and having probably been one of the worst clients in the agency’s history, I realized that it would have been a horrible mistake to join any abroad agency regardless whether onsite or offsite. Essentially, the onsite agencies always end up saying what every client wants to hear without it actually being necessarily true. Just the fact that you may not speak Russian is enough to misinterpret some essential factors and the inability to distinguish between the good and the bad. It is therefore extremely difficult to get a good idea of ​​your future wife and of her intentions. Marina is greatly skillful especially in the areas of honestly and transparency, she speaks fluent French, and she most importantly merges a network of agencies that break down international barriers. With these various customers, she is thus able to pressure external agencies directly and successfully, so that her customers are treated with the greatest possible quality, consideration, and attention. This is exactly why, I especially recommend Marina's agency. I had never thought that a day would come where I would be in need of services form a matrimonial agency, but after a long research on finding a dating agency website; I had the surprised to be fortunate enough to stumble upon Inter-Matrimonios (Inter-Mariage) on the Internet. I was mostly impressed by the clarity of their information which was why I took the decision to become their client. Ekaterina; the representative in Spain, was able to oust any of my doubts and was a great help in helping me find the woman of my dreams. From that point forward, all went smoothly: I matched with several women and then, a few months later, I went to Ukraine to meet one of them. I have to admit that although I am used to traveling frequently for work, I had never made this kind of trip ever at any point in my life. However, things were very well organized, I followed the advice I was given and all went but smoothly. However, my first meeting with this particular lady did not bring any positive results, but happily Polina; the director of the agency in Dnepropetrovsk, intervened professionally and put me in contact with another young lady who later became my wife. We first started off by a simple match, then we decided after a few meetings that we wanted to get married. Things were not too easy because the bureaucracy of both of our countries extremely slowed things down and complicated the whole process. All we had to do was to be patient and our determination had dealt with the rest. Today we are married since a long time and are very happy. It is with great pleasure that I come to testify to the professionalism, the seriousness and the listening of Marina and its agency Inter-Mariage. For me, knowing this agency has changed my life in a few months. It is with great pleasure that I write to you this testimony to about the competence of Marina; form Inter-Mariage Agency, at how she is completely serious about her job and her amazing listening skills. For me; just knowing this agency, has changed my life. It all started in December 2008 when a Russian woman wrote to me on the internet; I had already been looking for a person and it had already been unsuccessful for several years. Later on this was proven to be an online scam. But thanks to Marina's advice, I did not fall into this trap. Then I thought to myself: Why not register in a serious agency like Inter-Marriage, and try my luck through seeking an adventure beyond France! After a free trial period, I matched with a few Russian ladies in January 2009; my attention was focused on a young woman living near the Urals. We matched and conversed for 4 months. We had so much in common that the encounter became inevitable. So, I left Perm in April for a week where I was sincerely welcomed by Natalia, who was in charge of the agency on that site. She gave me extremely valuable advice and was a very good listener. It was during these very moments that my life changed; when I actually saw this magnificent person for the first time. And who a few months later, had become my wife: Masha. We got to know each other even better and our Love was born during this magical week. Masha came to join us; my children and I, on vacation for the month of July, where I also met her mother who had also been married to a Frenchman. It was during this unforgettable holiday that we decided to get married because for both of us, it merely became obvious. Masha returned to Russia. After two and a half months and a few administrative documents, we were united again, finally summing up our marriage on the 14th of November. We now happily live our very own love story. I can tell you that I would never forget this sign of destiny that led me to Marina and her esteemed agency to who finally helped me find the woman of my dreams. A thousand thanks to Marina and to all your teams; for allowing us to find our happiness and to love each other. I would like to write a few words to you in order to give you an update on some of our news. You wonder who this is writing to you and I do understand. I am Luc from Seine-et-Marl. I had been a member of your esteemed agency since 2009 and had met Masha from Perm because of your amazing liaising. I think you might have a small memory of us, we left you a testimonial on your site when we got married in November 2009. This message aims to tell you that everything is going very well, we are always very happy together and live in happiness partly thanks to you, again thank you wholeheartedly. Masha has been very well integrated in France now. We look forward to her 10-year residence permit which will arrive soon (namely in June) after so much effort. She also had her first job in Paris for almost 3 years and she was able to enter the world of work in France; which is not easy, especially when you come from another country. Her business ended recently but we are still confident for what the future has in store for us. Our main goal through this is to inform you that we are waiting for our latest member of the family to arrive sometime around the month of December. We are already very happy with this pregnancy and each of our parents and families are crazy about the joys. I often think back to you and at how this encounter has totally changed my life for the better, and who knows one day to meet. Had it not been for you and your esteemed team, I would not be here writing my overflowing joys to you. I also hope that you are well and that happiness will shine in your home and amongst yours. Marina, receive from us all the respect that we bear you and all your teams. To those who have found the incredible job of making love stories such as ours, come true. It is a real pleasure for me to write this testimonial about the happy event which; thanks to you, has come to its completion as of this summer. I confess for having hesitated to cross through this important course for a long time before hoping to meet right fit for me without having knocked on the right door. Fortunately, everything went flawlessly with your help, advise and those of your agency’s in Siberia. I mention Tatiana; the director, and Oxana; her assistant, who were great psychologists and considerably well organized. After a first trip on the spot where I was able to meet young and modern women who was sincere and above all motivated from the idea of ​​creating a family over time. I finally decided to invite the woman who I had most been infatuated with (and the woman who is my wife today), to come and visit me. It took patience from both our parts to "well adapt" to each other and finally to appreciate one another enough to decide to make the big decision of uniting ourselves. Of course, not all is simple when in such process such as; administrative problems, distance, and the language barrier but we can overcome all this without too much hassle, it even strengthens most relationships. Again, I thank you for your help and support throughout this process. Taking the first step forward poses the greatest difficulty. But Inter-Marriage is a professional and almost perfect agency: to all the questions asked, one obtains an answer. Even if many questions were asked from the start regarding; the initiation of the trip, advice for a person who is not very familiar in travelling to Russia. Moreover, they make sure all goes smoothly, and assure that the whole experience leaves very beautiful memories. To get to the reception; you need an appointment (fortunately, especially since you do not speak the language), interviews, transportation, from the eventual conclusion of the small trip to a tourist resort all the way to the departure of the plane, everything was worth it, in the country of Gagarin and Tolstoy. Bravo for Inter-Marriage, in all the varied aspects of his company. Furthermore, for any Frenchman wanting to achieve a peaceful relationship with a Russian woman, the question of language is a priority. A Russian woman rarely speaks French. She finds herself in a very interesting country, but is deprived of the essentials: discussion and communication. This may be the occasion for cooperation between husband and wife. She will also find other Russian nationals with whom she can find a balance with. Regarding the rest, there is little difference with a woman of another nationality: for instance, finding a job or an occupation and contributing to household expenses... Finally, to choose a Russian woman, supposes that beyond romanticism; that French is comparable to this country, we are really interested in Russia beyond the fog in which we tend to portray it. We then discover another world, sometimes strange, always original, and enormous in culture. What better ambassador than your own wife to understand this intriguing world? Is not that all we are looking for? It is quite marvelous that our modern age; through serious and honest agencies like intermarriage, allow individuals located on the confines of the world to meet and share a great love for each other. Thank you so much to the director; Marina Fedorova, who knew how to run an essential business. When I decided to try to meet someone from Russia or Ukraine, I turned to Inter-Marriage because their agency seemed to be very serious to me. I did not have to regret my decision, as it is true that Marina Fedorova made sure to always guide me during all my steps. Through her, I was able to match with several ladies before choosing the ones that seemed to me more suited to what I was looking for. For a few times, I happened to come across people who were not too serious, Marina immediately deleted them from my file, which speaks volumes about the rigor of Inter-Marriage. After a match with a girl of several months, I finally went to Dnepropetrovsk to meet her... and she proved not to be at all the person made for me. But the director of the local agency in collaboration with Inter-Mariage; Anna, then proposed to me to meet another lady who I was really interested in. On my return to France, we began such an endearing communication, after which I went twice to Dnepropetrovsk. Lyudmyla and I are now happily married. We flew in on September 2008, and everything went ideally well. The advice that I could give to future members is to go and meet people of their choice through direct contact, it is through such ways that one can know if their match is actually a good fit for them or not. The partner agencies of Inter-Mariage were meticulously selected with care. I would like to add that when we decided to get married, Lyudmyla and I asked Marina Fedorova for advice on the administrative steps that had to be taken. This proved me that she will go through extreme ends to find a solution for her clients. We have always been informed with great skill and kindness. I remember in particular an e-mail that Marina sent to Lyudmyla in Russian, to check if all the documents she had to provide to the consulate were conform and contained all the right details. It is thus for all these reasons that we thank Inter-Mariage for what it has brought us. We could only emphasize so much to those who are looking for an appealing significant other to seek guidance from such serious and esteemed agency.